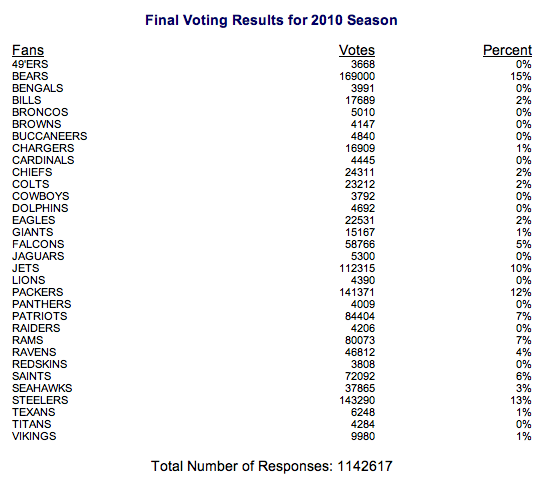 Bears Fans Cast The Most Votes In The 2010 Competition! However, the Bears did not win their championship game and so the 2nd Tempt Destiny billboard of chance went to the Steelers who had more votes then the Packers thanks in large part to the Bears fans who voted for the Steelers to make sure the Packers wouldn't win it. Beginning with SB XLIV, we will do two different types of Tempt Destiny billboards, one of choice (team with the most votes) and one of chance (SB bound team with the most votes). If the team with the most votes does not make it to the SB, then we will do the next TD billboard for the team that has the most votes of the two competing SB teams. (see press release).